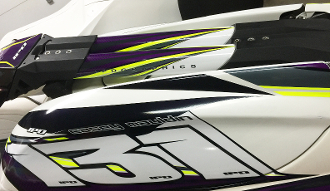 Complete the look of your new IPD jet ski graphic kit with this easy to install handle pole tube wrap kit, inspired by our popular JS2 Design. Available for most of the popular handle-pole types. PICTURE FOR ILLUSTRATIVE PURPOSES ONLY, YOU SELECT THE COLORS YOU WANT.